Why do people hire a Tulsa guardianship attorney someone they love faces a hearing about a court-appointed guardian? Simply put, because they care. Courts appoint guardians to make decisions for a person who lacks sufficient capacity to manage their own needs, such as to provide food, shelter, clothing, medical care and other necessities. The decision to have a loved one placed under guardianship can be difficult. When someone they don’t know or trust is appointed as a guardian, the person can be further isolated from those who care the most. The outcome of guardianship proceedings can have a lasting impact. When you consider the prospect of a court-appointed guardian, you are not alone. As medical advances and improved quality of life extend life spans, individuals’ mental capacity can often lag behind. And while our society provides rich opportunities for some, others for many reasons fall between the cracks, unable or unwilling to provide for their own basic needs. That’s often when a court steps in. A Tulsa guardianship attorney can help you find the best outcome in a difficult situation. If you would like a free confidential consultation with a knowledgeable Oklahoma guardianship lawyer, call the Wirth Law Office at (918) 879-1681. The role of a court-appointed guardian can differ depending on the age of a ward (the person placed under a guardian’s care). When minor children are placed in the care of a guardian, the guardian can be financially responsible for all of their needs, including use of the guardian’s assets to provide care for the child. Where minor children are involved, a guardianship doesn’t have the permanence and estate planning implications associated with adoption. When a court-appointed guardian is selected to care for an adult, the guardian is usually not responsible to provide financial support out of pocket. Instead, the guardian may manage whatever assets the ward has available, or arrange for assistance through public agencies, private charities or whatever other resources may be appropriate. A guardian might not want to be responsible for a ward’s financial affairs. In those circumstances, the guardian may ask the court to appoint a conservator. In either arrangement, the guardian will be obligated to annually file reports with the court detailing the ward’s circumstance. A Tulsa guardianship attorney can assist in determining the best guardianship arrangement, anticipating future obligations a guardian may face, and complying with routine obligations of a guardian. When selecting a guardian for a physically or mentally incapacitated person, the court seeks the best choice according to the ward’s preferences and needs, and who is available and willing to fill the role. The guardian may be a person nominated by the ward before they were incapacitated. Otherwise, the incapacitated person’s spouse, an adult child of the ward, a parent of the ward, a relative with whom the incapacitated person resided prior to the petition for guardianship, a person nominated by a current caregiver of the incapacitated person, or a legally qualified specialized care professional. A person may be appointed multiple guardians who share legal responsibility, or in some cases limited guardianship. The constitutional guarantee of due process provides an incapacitated person the right to represent their own interests in court proceedings — with the help of an attorney and in a jury trial if necessary. An attorney may be hired using funds from the ward’s estate, or in the case of an indigent ward, have the service of a court-appointed attorney. A person petitioning for guardianship is also entitled to legal representation in guardianship hearings. Estate: The property of the person subject to the guardianship proceeding. Guardian Ad Litem: A person appointed by the court to assist in making decisions. General Guardian: A guardian of the person or of all the property of the ward within this state or of both person and property. Guardian: A person appointed as general or limited guardian of the person, and/or general or limited guardian of property, or as a special guardian. It does not include guardian ad litem. Guardianship Plan: The plan for the care and treatment of a ward or for the management of the ward’s financial resources, or both. Guardianship Proceeding: A proceeding for the appointment of a guardian or for other orders regarding the condition, care or treatment of or the management of the financial resources of award. Limited Guardian: A person authorized by the court to exercise limited powers over the person of the ward, or over the property of the ward within the state or of both person and property. Minor: A person under 18 years of age. Special Guardian: A guardian appointed for an emergency purpose, generally not to exceed 30 days. Ward: A person over whom a guardian is appointed and a person over whose property a guardian or conservator is appointed. 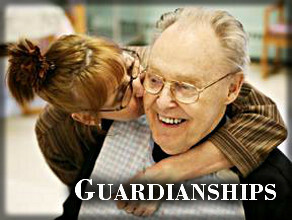 Why Hire a Guardianship Attorney? Guardianship proceedings can be a routine legal procedure involving the agreements between all involve or they can be a difficult, emotionally burdensome endeavor. Whatever your circumstance, a Tulsa guardianship attorney can provide counsel and legal representation so you know what to expect and achieve the best results for you and your loved one. You can move forward with the confidence that your needs and concerns are in qualified hands, and that guardianship proceedings will be handled in a knowledgeable, confidential and compassionate manner. If you would like a free consultation with an Oklahoma guardianship lawyer, call the Wirth Law Office at (918) 879-1681 (or toll free at (888) Wirth-Law) or submit the question form at the top right of this page.